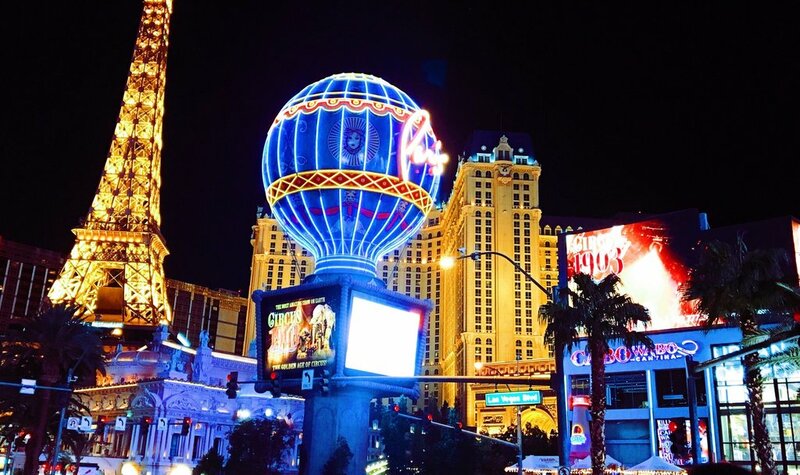 In case you haven't read it yet you should check out our Tips for Las Vegas here, but in the meantime come join us on our little trip through part of the Las Vegas Strip! We hope you enjoy and that it makes you want to visit Las Vegas yourself, if you don't already want to that is. The first breathtaking hotel you’ll encounter in our route is The Mirage. The Mirage has 3,044 rooms and has a Polynesian theme. Like every single hotel on the strip, it has its very own casino which is very famous and has been featured in quite a lot of action movies. It is one of the many hotels which is owned and ran by MGM Resorts International. One of the amazing features of this hotel which everyone is welcome to enjoy for free is the Volcano Show outside the hotel. There is a huge volcano built outside surrounded by water and at certain times of night the Volcano erupts and what follows is a magnificent 10 minute fire and water show. Up next is the Ceasars Palace. Featured in shows such as Season 5 and 6 of Friends, Ceasars Palace follows a Roman Empire theme with gladiators and typical fountains and statues. It is known for its luxury rooms and casino, and is considered one of the most prestigious casino hotels in the world. Constructed in 1966, this 3,976 room hotel features an enormous range of restaurants and entertainment options. From here you can already spot Las Vegas’ Paris. This is a little area in the strip that features typical monuments and resemblances of Paris, and as the cover photo of this route should point out it is a very iconic spot in the Strip. This is only one of the many typical Roman Empire fountain statues you can find around Ceasars Palace. This one in particular reminded me a lot of the famous fountain in Rome. One of the nicest things about hotels in Vegas is that you’re allowed to go inside and roam even if you are not staying at that hotel. Up ahead you’ll see beautiful art expositions inside the Bellagio, but one of my favourite things about Ceasar’s Palace is the fact that if you walk around outside the hotel you’ll find all these beautiful statues. The architecture of the hotel itself is absolutely breathtaking. You’ll probably recognise it from the movie The Hangover, or even one of the Ocean’s movies such as Ocean’s Eleven. Once again, we are getting closer and closer to Paris and from here you can already see the hot air balloon with the name Paris on it. One very cool feature of the Vegas Strip is that they encourage you to cross the road using one of their beautiful bridges as much as possible. Therefore, you’ll find a lot of very pretty “bridge tunnels” made to try to allow a safer passage from one side of the road to the other. This is necessary due to the huge crowds that the Strip entertains all year round. Another very cool feature found in Las Vegas is the fact that almost every hotel features a shopping galleria area which everyone is welcome to check out. Depending on how fancy the hotel is, the types of stores found within it will vary. For example, the Bellagio Gallery as you can see above features very high-end stores such as Tiffany & Co, Gucci, Giorgio Armani, Hugo Boss, Louis Vuitton and many others. Here you can take a sneak peak at the casino of the Bellagio. You’ll find that the fancier the hotel is, the more expensive gambling becomes, so keep that in mind if you feel like playing but don’t have a huge budget for it. One of my favourite things about the Bellagio is their art gallery. In the front desk, which you can see in the picture above, you’ll find a piece that was hand made (flower by flower) made of glass. It is absolutely stunning. Down the hall from here you’ll find an incredible little art “forest” with a talking tree and two gigantic and beautiful bird statues. Right outside the Bellagio you’ll find the world-famous water fountain show which has Paris as a backdrop. Enjoy the night show which happens once every 15 minutes until midnight. The midnight show (the last of the night) is extra long and has the national anthem as the theme song. Enjoy your Las Vegas trip and remember: what happens in Vegas stays in Vegas!